This May, my aunt and uncle in Australia celebrated their Golden Wedding. As a surprise, their son requested that my Dad sing the the same song he had sung for their wedding and have the recording sent over. So 50 years later, my Dad, now 88, performed ‘I’ll Walk With God’. I heard the recording and though I wasn’t born at the time of my aunt’s wedding, I had heard him sing this for his parents’ Golden Wedding too. The song, the lyrics and my Dad’s singing voice always have the ability to move me to tears. I can only imagine how moved my aunt and uncle were too. Music has been a big part of my life. My Mom constantly sang to me and some of her musical choices would make me weep. I’d beg her not to sing some songs – because of the lyrics and the emotion she put into them. I started singing at an early age and a few years ago, my uncle presented me a recording of me singing at age three. It was cute, even if I say so myself. Music featured in a lot of our extended family gatherings at my grandparents’ home. Music meant Christmas and New Year and summer holidays. My cousins and I all seemed to have our own signature song that we’d be asked to perform. Singing around the piano meant family and fun and also gave us a lot of confidence. As I think back, I remember my Grandfather teaching me a special song – After The Ball Was Over. He’d sing the verses and I’d sing the chorus. It made me feel special and loved and listening to the song today brings back so many memories of him – memories of being loved. Later, my brothers and I, teamed up with some cousins of ours and we sang a couple of times on All India Radio. Oh the joy of practicing together, giggling our ways through recordings, singing for a few small shows and being asked to do a repeat. One of our ‘hits’ was Simon and Garfunkel‘s, Richard Corey! As I grew older, I got involved with a group of young people from Church and we made a lot of musical memories together. Just recently, someone started an online group and we’re trying to reconnect, and I realized how much music brought us together – young people from various backgrounds bound by faith and love of music. Now, over 25 years later, music can still get us talking about the ‘old days’. Even later, I’ve used music in my teaching and training – knowing that music is a great tool for language learning. Music is constantly used to heal, to inspire, to unite, to keep spirits up. I can never forget how a few years ago, a group of Chilean miners trapped underground for several days, requested for music to be sent down to them – as I recall, Elvis Presley was their choice. 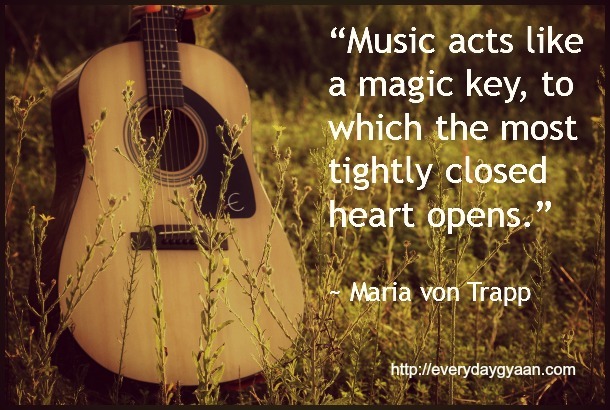 I’m sure we’ve all experienced it – the awesome power of music – to inspire, to entertain, to heal, to educate. I’m taking part in the Write Tribe Festival of Words and NaBloPoMo for December. Truly music is the language of the heart and life. And it can take your hand in all times of your life. Wow a very musical family. I remember those Abba years. I had a T shirt with a picture of Abba on it. I paid Rs75 for it (which was a lot of money back then) from my pocket money savings – it felt like I had just bought some gold. What would we do without music? As I have already mentioned my mother sang beautifully. And one of my aunts has a recording of it. I have been begging her to send it to me. But she is not ready to part with it. Every time I go to Delhi we have the same argument. I too like you would often beg her not to sing some of the songs. The music always has had a power over me which sometimes has helped and sometimes made me weak.. Faith and music make for the perfect combination. I studied at a convent and I remember loving the hymns we sang with such fervour. Now when I hear my son singing ‘this little guiding light if mine’ or ‘joy to the world The Lord has come’ ..I cannot even begin to explain how nostalgic I get. We all end up singing at the top of our voices. It’s ust so much fun. Hi Corinne, it’s so true. How many times do we hear a tune from times gone by and we’re transported back in our memories. And we know how music is used in movies or tv to instill all kinds of emotions in us. Today, since I like to have the happiest emotions I can, I choose to play and listen to music that fills my heart with gladness. I love how families have their songs – whether they love them or not, they’re endearing! Without music, I can’t imagine life. I’d love to hear that recording of you! I agree completely–music is such a wonderful part of life and a lovely expression of emotion. How lucky are you to have had so much of it in your family life! I began taking voice a few months ago and it’s way harder than I expected, but so rewarding! Wow! You have had an amazing musical journey. Music can truly lift your heart, warm the soul and make you feel good and sad at the same time. It is truly an incredible force!